New law and justice facilities are on the way for communities in Manus, with construction of a Royal Papua New Guinea Constabulary (RPNGC) complex in Lorengau commencing this week. In partnership with the Australian Government, the PGK15 million RPNGC Provincial Police Headquarters and Lorengau Police Station aims to increase access to law and justice services, and support police in making communities safer. Commissioner of Police, Mr. Gari Baki outlined his vision to those gathered for a modern, professional RPNGC, and encouraged all who use the new facility to take pride in their important role protecting and serving the Manus community. 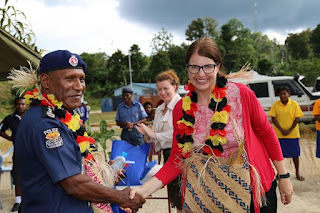 Australian High Commission Minister-Counsellor Catherine Fitch said the Papua New Guinean and Australian governments, together with RPNGC, the Manus Provincial Administration, the law and justice sector, and the Manus community have worked together on this project since its inception. “The progress we celebrate today is testament to the spirit of partnership, and I would like to thank all the stakeholders for their enthusiastic and continued support. “The new Provincial Police Headquarters and Lorengau Police Station will serve Manus communities for many generations to come,” Minister-Counsellor Fitch said. The RPNGC building will support community policing and specialised services such as a family and sexual violence unit, as well as links to other legal services. The building design provides improved holding facilities. It also improves access for people living with disabilities, reduces environmental impacts and is energy efficient. The construction, at the site of the original Lorengau Police Station, will take approximately 14 months, with completion expected by the end of September 2017. During this time, policing services are continuing at Lorengau temporary police station, established next to Independence Park. The new complex is part of a broader package of development assistance for Manus Province, funded under Australia’s aid program. Image 1: Manus Province Deputy Governor, Honourable John Popot, Commissioner of Police, Mr. Gari Baki, and Australian High Commission Minister-Counsellor Catherine Fitch, officially signaled the beginning of construction of a new Manus Provincial Police Headquarters and Lorengau Police Station in Manus Province. Image 2: Commissioner of Police, Mr. Gari Baki, and Australian High Commission Minister-Counsellor Catherine Fitch at the construction site of the new Manus Provincial Police Headquarters and Lorengau Police Station.